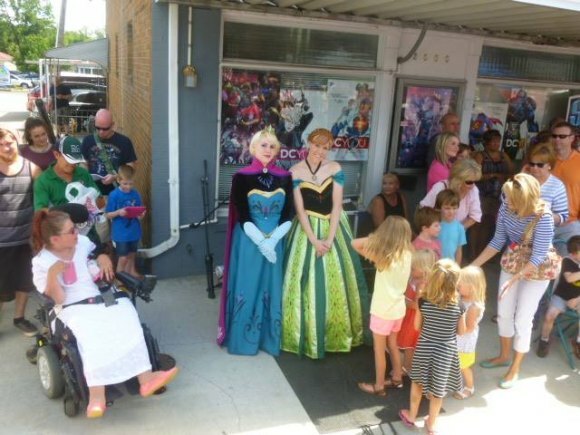 Heroes4 Higher co-anchored a block party with the likes of Queen Elsa and sister Anna on Saturday, Aug. 1 at the Superhero Creamery in Ashland, Ky. Hundreds of adults and children turned out to get a picture with their favorite character, grab some ice cream, enjoy face painting, play video games,and learn life lessons such as not bullying. Batman also told the crowd of the bravery of a cancer stricken child ("Hollywood") suffering from cancer. He encouraged him to fight the good fight. Other heroes were Captain America, Bat Girl, and Spiderman , along with the Bat Mobile. Anna (Jennifer Propst) and Elsa (Lauren Elsa Littlepage) entertained with music from the film, "Frozen." They posed for pictures with hundreds of children, including one with four legs. Elsa's next appearance will be Friday at Camden Park's Wayne County Fair.